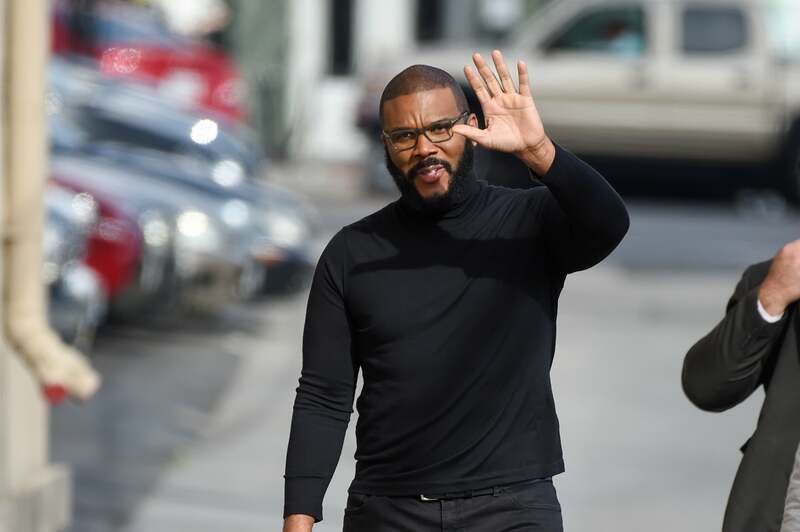 Tyler Perry stopped by Jimmy Kimmel Live! on Monday night to promote his latest film, Acrimony, but while he was there, the writer and director explained how he got into a fierce bidding war with Jay-Z and Beyonce’s daughter, Blue Ivy. Over the weekend, Perry attended the Wearable Art Gala, a charity event to support Tina Knowles Lawson and Richard Lawson’s WACO Theater, when he spotted a painting he loved. He decided to take out his paddle and bid on the piece, but there was one problem — he had stiff competition from a six-year-old. “I said, ‘Oh, I’m gonna teach you a lesson today!,'” Perry recalled jokingly. To his surprise, Blue Ivy wouldn’t go down easily. “She keeps going up and up and up with [the paddle],” Perry explained. Perry and Blue Ivy battled it out until the bidding reached $20,000, and that’s when Jay-Z reportedly took Blue’s paddle away and Perry won the painting. Blue Ivy didn’t go home empty handed, though. She won a “’36 x 36′ art piece made of deconstructed law and medical books California” for the low, low price of $10,000.